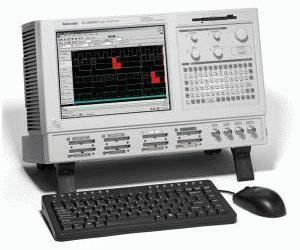 TLA5000B Series logic analyzers combine debug power with simplicity and affordability. The affordable TLA5000B Series logic analyzers make high-speed timing resolution, fast state acquisition, long record length, and sophisticated triggering available to any digital designer who needs to identify initialization failures, operation crashes and intermittent operation. For first-time as well as experienced logic analyzer users, the TLA5000B Series is ideal for single-bus timing and state analysis. An intuitive user interface, familiar Windows-based desktop and OpenChoice® networking and analysis features make the TLA5000B Series logic analyzers easy to network into your design environment. 500 ps timing resolution and 128 Mb record length with simultaneous 125 ps MagniVu timing resolution within each acquisition means you can measure digital signal timing on increasingly faster signals with confidence. With MagniVu timing resolution, find difficult problems such as digital logic errors, glitches, setup/hold violations, and crosstalk quickly. Use setup/hold violation triggering and display to validate setup/hold performance of digital devices. Today, most designs can have both digital and analog anomalies. With iView™ time-correlated digital-analog view, you’ll clearly see how analog anomalies are affecting your digital signals—right on your logic analyzer display.